By Karrar Haider in Internet. Updated on April 26, 2018 . If Gmail is your go-to email service like over a billion other Gmail users, then you must want Gmail to handle all your emailing needs. However, it can be really annoying to click on a mailto link in your browser only to see your OS email client asking you to set it up. Thankfully, you can easily set Gmail as your default email client in most of the popular browsers. Today I will show you how to set Gmail as default email app in Chrome, Firefox, Opera. Safari and Internet Explorer. In Chrome, you can easily set Gmail as default email app right from the Gmail interface. Open up Gmail and you will see a "two arrows" like icon in the address bar. Click on it and select "Allow" to let Chrome open mailto links in Gmail. In case you don’t find this icon in the address bar, you will have to configure it from Chrome settings. From the Chrome menu, click on "Settings" and then click on "Show advanced settings…" at the bottom. Here click on "Content settings…" under the "Privacy" heading. Now scroll down and click on "Manage handlers" under the "Handlers" section. Alternatively, you can also type chrome://settings/handlers in the address bar and hit enter to access the same location easily. Once inside, click on the drop-down menu next to "mailto" option and then select "mail.google.com" from the list. This will set Gmail as the default email for opening mailto links. 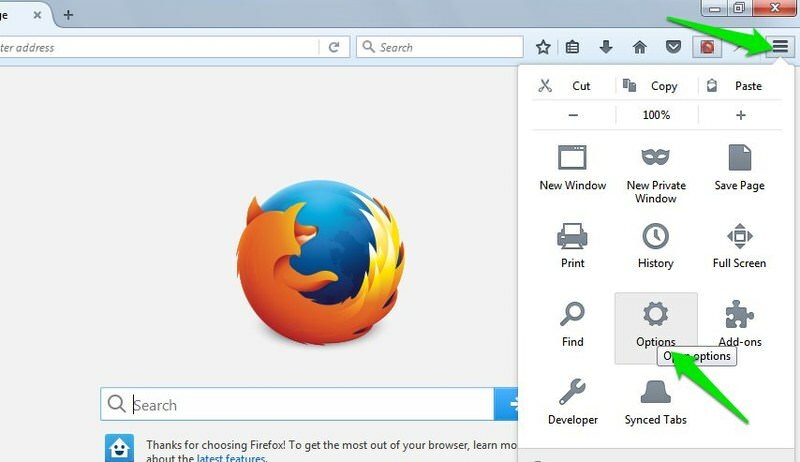 In Firefox, click on the hamburger menu on the top-right side and select "Options" from it. Here move to the "Applications" section from the left menu and look for "mailto" option from the list. Click on the drop-down menu next to "mailto" and select "Gmail" to set it as default. Go to Opera menu at the top-left corner and select "Settings" from it. You can also press Ctrl + P to access the settings. Now go to the "Privacy & security" section from the left menu and click on "Manage handlers" at the end. You can also enter opera://settings/handlers in the address bar to directly access this section. Here click on the drop down menu next to "mailto" and select "mail.google.com". Now all the mailto links in Opera will open in Gmail. In Safari you can use the mailto extension that allows you to set Gmail or and some other email services as default email client for Safari. Download the mailto extension using Safari and install it. You will see a list of email clients in the extension interface, select "Gmail" here to set it as default email client on Safari. 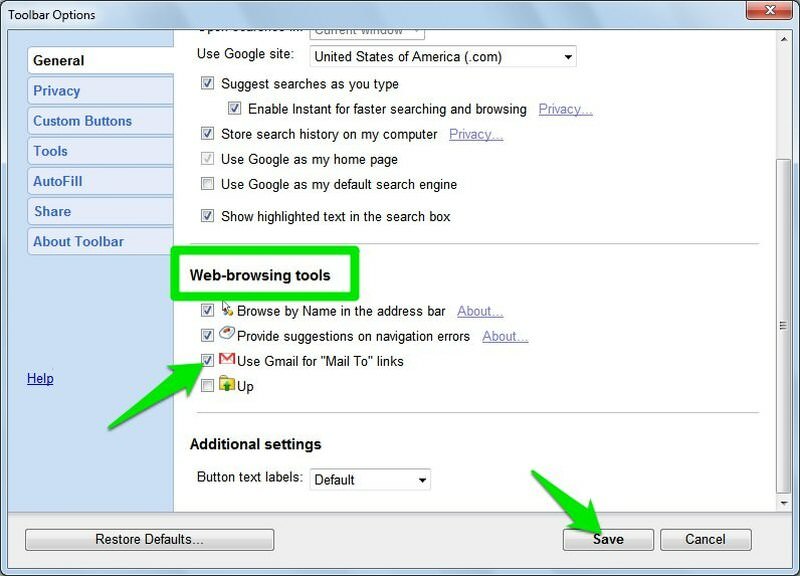 If you are using Internet Explorer, then you can use Google Toolbar to get many features of Chrome in Internet Explorer, including the ability to set Gmail as default email app. Download and install Google Toolbar in Internet Explorer and then click on the "Wrench" icon at the right end of the Google Toolbar. This will open Google Toolbar settings. Scroll down in the "General" section and check the checkbox next to "Use Gmail for "Mail To" links" under the "Web-browsing tools" heading. When you will click on "Save", Internet Explorer will be set to use Gmail as default email client. You can also open mailto links outside of your browser in Gmail as well. All you need to do is set Gmail as your default email app in your preferred browser using the instructions above and then set your browser as the default email app. Set Gmail as default email app in your browser and then follow the instructions below to set your browser as default email app. 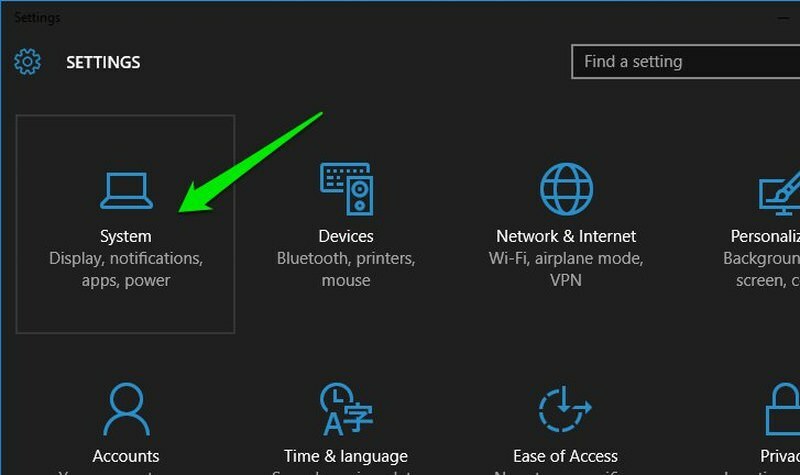 In Windows 10, go to "Settings" from the Start menu and then click on "System". Here click on "Default apps" section and you will see default app types in the right panel. Click on "Mail" under the "Email" section and select your browser. In Mac OS X, you will have to open the default "Mail" app to add another app as default email app. Open the "Mail" app and go to "Preferences" from the "Mail" menu. Here under the "General" tab, select your browser in the "Default email reader" option. Apart from setting your browser as the default email client, you can also command the browser to open mailto links without replacing the default email client. All you need to do is include "Mailto" link type in your browser’s "Default programs" settings. After configuring Gmail as default email client in your browser, open the "Control panel" and click on "Programs". 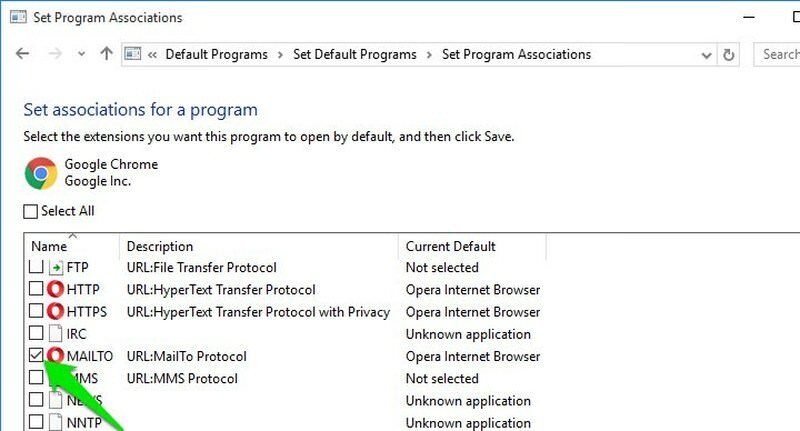 Now click on "Set your default programs" under "Default Programs" section. 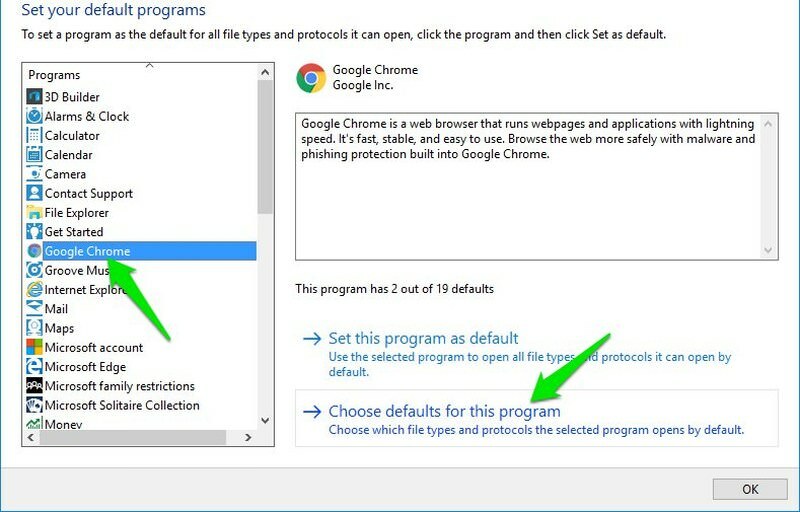 From the list of programs in the left panel, select your browser and then click on "Choose defaults for this program" in the right panel. On the next page, check the checkbox next to "MAILTO" option and "Save" the changes. This will force all mailto links to open in your set browser no matter where you found them. 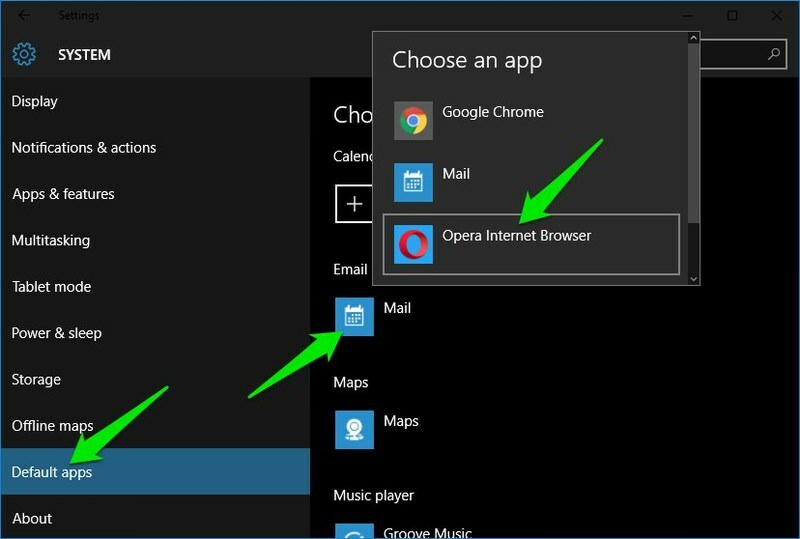 Tip: You can use this method in older versions of Windows to force mailto links in Windows to open in your browser. So here is how you can set Gmail as your default email app for opening mailto links. If you want Gmail to handle all your mailto links, then you should set it as default email app in both your browser and your operating system. If you have any questions, let us know in the comments below.